Meals For Mutts is an Australian made, natural and organic pet food which uses premium high quality ingredients, balanced omega fatty acids, and essential vitamins and minerals. Meals for Mutts? number one priority is animal welfare, and so best practice harvesting and farming procedures are always adhered to. 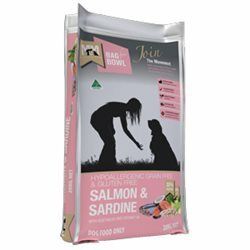 This highly palatable grain free dry food contains salmon and sardine meats, which provide exceptional levels of omega 3, 6, and 9. These are perfect for your dog?s brain function, and also assists with the health of joints, the cardiovascular system, skin, nails, and teeth. Chick peas, also known as Garbanzo Beans, provide a low glycaemic grain alternative which is a great source of protein, folic acid, fiber, and lysine. The inclusion of chick peas helps with digestion, cardiovascular health, and energy production, as well as growth and maintenance of tissues and muscle mass. Fish and chickpeas are great options for dogs with allergies, as they offer natural, healthy alternatives to common allergens such as chicken and wheat. Omega 3 fatty acids play a major role in immune and hormonal system function, and have anti-inflammatory properties. This diet also contains alfalfa, kelp, and Yucca Shidigera extract, and is preserved using natural vitamin E and rosemary extract. Salmon & Sardine, chickpeas, seasonal vegetables, alfalfa, natural fats and oils, omega 3, 6 & 9, coconut oil, turmeric, parsley, pre & probiotic, kelp, vitamins A, C, D3, E, K, B1, B2, B6, B12, niacin, pantothenic acid, folacin, biotin and natural organic acids, plus minerals, calcium, phosphorus, sodium, copper, zinc, iron, manganese and iodine. Also contains Yucca Shidigera extract and natural flavours, and is preserved using natural vitamin E and rosemary extract. I wasn't sure my choccy lab would like fish but it IS food so I should not have been surprised. I can smell the fresh odour coming off this product so it's no wonder my dog tucks in to it straight away. It's definitely his new favourite after the M4MUTTS Duck & Turkey. It has all the right ingredients for a healthy diet so it sure makes my choice easy next time. Highly recommended. It's just a shame about the delivery as I have received my parcel yet and my dog food is running low! Have tried a number of other decent brands including Black Hawk and found this to be the best. Both dogs are large, 11 years or over, one with skin and sensitive stomach issues and this food is great. As soon as I changed to it from the Turkey and Lamb found immediate improvement in both areas. 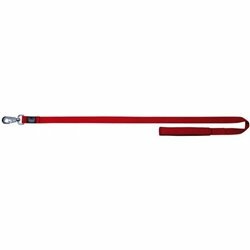 Also 20Kg bag is great value, with most other equivalent brands of the equivalent product being 14-18Kg for the same price.